Children’s books. Books are one thing that I don’t mind my children having too many of because I believe in literacy. This can be a great time to introduce them to books about Easter. A movie. I scored a deal on Disney’s Snow White when it re-released at the end of last year. Got it for $4, DVD and Blu-Ray. I was going to give it to Kaye for Christmas, but decided she had too many gifts for Christmas. So I saved it for a later occasion, like Easter. A game. There are some great deals on children’s board games and family games. A popular game at our house right now is Scoop . I found it at our local Hallmark store. Kaye loves ice cream and it is simple enough for her to understand. Summer toys. Prep them for summer outdoor fun with a kite, sidewalk chalk or a bubble machine. It’ll also encourage them to be outdoors. Gardening supplies. Celebrate life by planting a seed. Visit your local home improvement stores for a indoor mini greenhouse that starts the herbs and vegetables. If you have a black thumb like me, some brands even guarantee growth. » Tell me… What do you put in your Easter baskets? 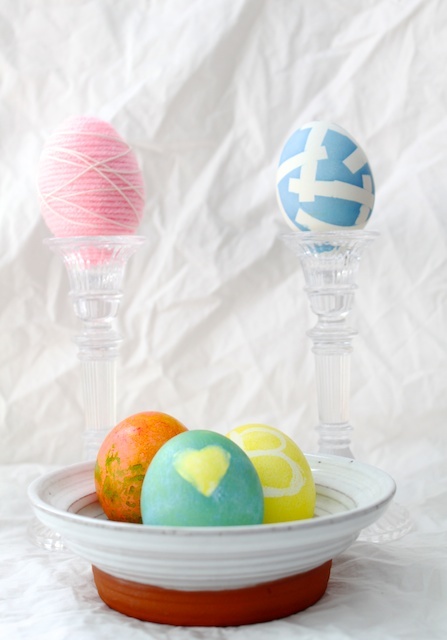 And don’t forget about the tutorial for dying the decorating Easter eggs. growing up we alway got a beachpail and shovel.. not only was it practical ( we used it to hold our eggs) but reminded us all that we would soon be at the beach!! 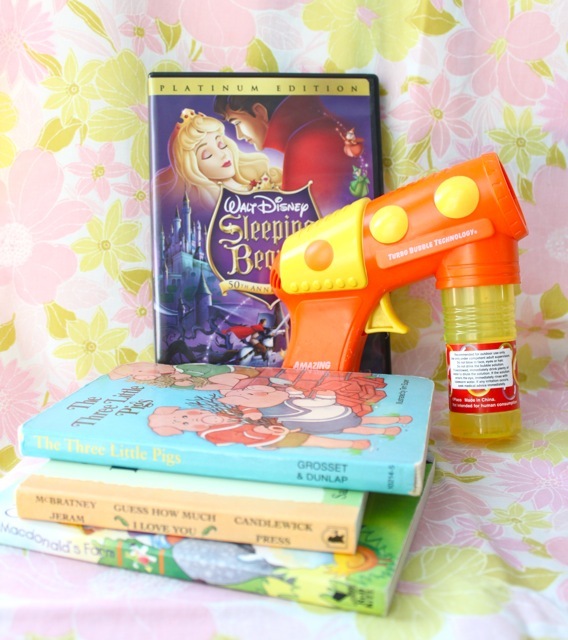 In keeping with my childhood – we always put a squirt gun in! Growing up in AZ we always got to use them right away. Being in UT right now, it’s a bit of a wait. Books, a few treats, and a new outfit. I made some little felt baskets for the girls this year. I will probably put in some bubbles, books, Easter stickes and chocolate eggs. Books and candy are pretty consistent in the Easter baskets I’ve put together for my son. I also add one or two dollar store toys that I know he’ll like–like a small airplane or truck. We do mostly the same things as you describe. I always buy a outdoor spring item. Last year I put sidewalk chalk, bubbles in their baskets. They are only ages 3 and 4, so we haven’t been doing this for long. I think I am going to add spring/summer pj’s this year in their baskets and my daughter has been wanting a Princess umbrella, so I got one for her and a Disney Cars umbrella for my son. I also cringe when thinking about loading them up on candy…..so I got lot so fruit snacks and individual wrapped animal crackers to go in there. For some “candy”, I will have some chocolate covered raisins and yogart covered raisins. Stickers are also a favorite. And, seeing my sister is a dentist, she always gives us toothbrushes! I love the $1 stuff at Target and Dollar Tree. We get an Easter Egg at Easter, sometimes the ones that come with the matching cup, but that’s all. It’s not really a big present giving day here, it’s more about getting together with family for a meal and to celebrate. I find it quite sad the way so many simple holidays get blown out of proportion and so commercial, I hope when I have kids that I’ll be able to focus more on family and just have a small token egg – I love your idea of a scavenger hunt / treasure trail to find the egg. Bubbles,sidewalk chalk, forget me not or morning glory seeds, socks, pencils, stickers, spring pj’s, beach towel, goggles…. My kids are older now and they each got a charm for their Chamilia bracelets, nail polish, hair do-dads, school supplies and a few Easter related items. those are all great ideas! thanks for sharing them with me. i’ll have to remember them for next year. When our boys were little we put their things in colorful plastic pails-which they loved for the sandbox or beach. One year I put our girls things in an ‘Easter’ hat, which was fun. And they served 2 purposes-an inexpensive new toy/hat plus their basket! Since my mother is a dollar store addict and buys little trinkets for my kids every time she comes over (thoughtful, but just because it’s $1, doesn’t mean we need it! ), I’m trying to limit the junk in my house…bubbles, flip flops, and jelly beans is all they’re getting this year!